"We went on a family vacation to Orlando along with our 5 year old son. Couple of days at the theme parks, my son allergies got triggered and we had to rush him to an urgent care. The nurse at the urgent care kept asking about his entire medical history including his doctors, the medications, his immunizations etc. I could barely remember his medications, let alone immunizations?? No way. I can't even pronounce them properly, let alone remembering them. 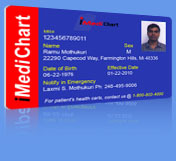 But, luckily we carried his iMediChart emergency health card using which the nurse could download all his medical data, just as she needed. It was so easy to download my son's medical history in a matter of seconds. We never know when this data would come handy and I am glad I took it." L.M, Novi, MI. "Absolutely love this service from iMediChart.com." S.P, Cheraw, SC. "This product will surely help reduce the medical mistakes that take place everyday in ER and hospitals due to lack of information at the right time." "For people like me who travel a lot, this is a must. I love my ICE card and the ability to keep my health records up to date. I would definitely recommend this product."